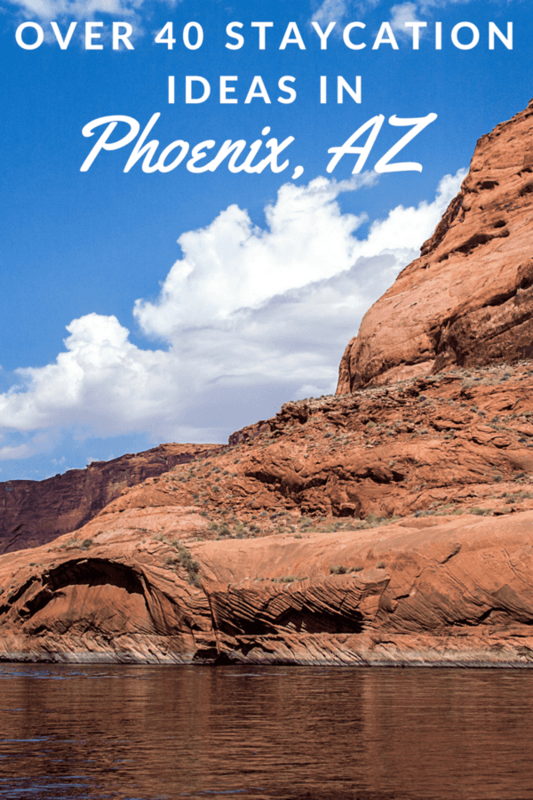 Enjoy the Phoenix area without breaking the bank! Check out this list of over 40 staycation ideas in Phoenix that you can do with the family. Chances are, you clicked on this post to get a list of staycation ideas in Phoenix. If you did, then welcome – you are in the right place! Peruse this list of events, attractions, and frugal activities to help inspire your family to see everything the Valley of the Sun has to offer. This list of staycation ideas in Phoenix is perfect for anyone and everyone. Whether you are parents of children, vacationers, newly transplanted Phoenicians or someone who has grown up and lived here for years, there is something for everyone. This list of staycation ideas in Phoenix aims to please large families, small families, and more. Arizona Science Center. (Phoenix, $$$): Tour over 300 hands-on exhibits daily from 10-5 p.m. with the exception of Christmas Day. Blue Star Museums. (Phoenix and Metro, FREE): FREE admission to over 2,000 museums across the U.S. for military members from Memorial Day to Labor Day. Deer Valley Petroglyph Preserve. (Phoenix Metro, FREE – $$): This archaeology museum and 47-acre Sonoran Desert preserve is home to the largest concentration of Native American petroglyphs in the Phoenix area. Challenger Space Center. (Phoenix Metro, $$). Visit the Challenger Space Center in Peoria Monday to Saturday 8 a.m. to 4 p.m. to learn about Space exhibits include satellite exhibits, a life-sized Iridium satellite model, a ten-foot Shuttle Atlantis display courtesy of Honeywell, a real landing gear tire from Space Shuttle Discovery STS-121, and gravity game. The center features autographed memorabilia and mission patches from past Space Missions. Desert Botanical Garden. (Phoenix, $$$): Take a tour featuring the desert plants native to the Southwest. Admission is FREE the second Tuesday of each month. Japanese Friendship Garden. (Phoenix, FREE – $$): Take a tour of the Japanese Friendship Garden on Wednesdays at 11 a.m. or 1 p.m., no reservations required. Admission is FREE on First Fridays each month with the exception of October. See website for hours. Phoenix Art Museum. (Phoenix, FREE – $$$): A permanent collection of over 17,000 works of Asian, European, Latin American, Western American art and American art & Fashion. Admission is free Wednesdays from 3 – 9 p.m. and voluntary donation the first Friday of the month from 6 – 10 p.m.
Cerretta Candy Company. (Phoenix Metro, FREE): Tour the Cerretta Candy Company in Glendale Monday to Friday, with tours at 10 a.m. and 1 p.m. Make sure you call in advance to book a tour. PING Golf Company (aka Karsten Manufacturing). (Phoenix, FREE): Take a tour of PING Golf Company Tuesdays, Wednesdays and Thursdays with a reservation. Scottsdale Trolley Tours. (Phoenix Metro, FREE): The historic Old Adobe Mission opens its doors for an Art & Cultural Trolley Tour on 2nd Saturdays. Reservations are limited and required. Scottsdale Museum of Contemporary Art. (Phoenix Metro, FREE – $$): Exhibitions on contemporary and modern art, architecture and design. Admission is free on Thursdays. Admission is also free Fridays and Saturdays after 5 p.m.
Heard Museum. (Phoenix, FREE – $$$): More than 35,000 artifacts displayed in 10 exhibit galleries, focusing on traditional and Native American Art. Admission is free the first Friday of every month from 6 – 10 p.m. (except in March). Native Americans are always admitted free. Admission is free for Active Duty Military and their Families Memorial Day through Labor Day. ASU Art Museum. (Phoenix Metro, FREE): A contemporary Art Museum with 5 galleries located in the Nelson Fine Arts Center. The Admission is always free. Mystery Castle. (Phoenix, $$): A man made monument here in Phoenix, with 18 rooms and 13 fireplaces, the Mystery Castle is internationally known and recognized by Life Magazine, McCall’s, HGTV Extreme Homes & more. The Castle is open Thursday – Sunday, from 11 a.m. to 4 p.m., October through May (except the holidays). Tovrea Castle. (Phoenix, $$$): The Tovrea Carraro Society provides a unique experience for visitors to Tovrea Castle at Carraro Heights; preserving, maintaining and restoring its historic structures, gardens and grounds, in partnership with the City of Phoenix. Tours must be planned in advance. Martin Auto Museum. (Phoenix Metro, $): The Auto Museum is a great place to check out rare & collectible automobiles – for someone who is a car fanatic. At the Martin Auto Museum, visitors can view history through the decades in this huge collection. There are a number of race cars and one-of-a-kind vehicles to excite any automotive, art or history enthusiast. Sunsplash. (Phoenix Metro, $$$): Golfland Sunsplash is home to everything from waterslides to a Toddler tadpole area, as well as a Wave Pool, as well as mini golf, go carts and more. Cost is quite high unless you visit after 5 p.m. and score reduced price admission. Kiwani’s Recreation Center. (Phoenix Metro, $$): A great place for the entire family, the center is more of a relaxed version of a large waterpark with a wave pool with 3′ waves, a 16′ water slide, and lap swimming for adults. Piestewa (Squaw) Peak. (Phoenix, FREE): The 2,608 foot Piestewa Peak is not only one of prominent landmarks in the Valley of the Sun, but one of its most popular hiking venues where over a half a million people hike its Summit Trail every year. South Mountain Park. (Phoenix, FREE): The city’s largest park with over 17,000 acres, South Mountain park is a great place to bring family and friends, or enjoy the views of the city with any of the many trails. Camelback Mountain. (Phoenix, FREE): Located 20 minutes from downtown Phoenix, Camelback Mountain is a Phoenix icon visited by thousands every year. Kids Bowl FREE. (Phoenix and Metro, FREE – $): Kids can score 2 FREE games of bowling each day this summer at AMF Lanes. Shoe rental is not included. Salt River Tubing. (Phoenix Metro, $$$): Spend a hot, Phoenix afternoon tubing down the Salt River with the family. Life jackets are recommended and cost includes shuttle. Riparian Preserve. (Phoenix Metro, FREE): The Riparian Preserve is in the East Valley on the Southeast corner of Guadalupe & Greenfield. Walk around the Preserve to see the Ducks and other wildlife – it’s a great place to visit as it’s right next to the Public Library. Freestone Park. (Phoenix Metro, FREE – $): Visit Gilbert’s Freestone Park, which is over 80 acres of several play areas, volleyball, tennis, softball and even fishing. There is a small amusement park (that is relatively inexpensive), and even multi-use trails. It’s a great way to spend an afternoon – take a picnic, kids can play. Stuffington Bear Factory Tours. (Phoenix Metro, $$$): Visit the Stuffington Bear Factory for a tour, Monday to Friday. Admission is $13 and you can make a bear while you are there. Hole in the Rock at Papago. (Phoenix, FREE): Take the family on a short, easy hike up to Papago Mountain’s Hole in the Rock to get a picturesque view of Phoenix. Yoga at the Biltmore. (Phoenix Metro, FREE): Every Sunday at 10:30 a.m., Lululemon shops in Chandler & the Biltmore host FREE yoga classes outside their shops. Bring a mat and water. Rock and Roll Car Show. (Phoenix Metro, FREE): Visit Scottsdale Pavilions at Talking Stick and Pima every Saturday from 4:30 – 10 p.m. for the Nation’s largest running car show. The car show features anywhere between 100-250 cars. Garage East. (Phoenix Metro, FREE): Head over to Gilbert on Sundays for live music on the patio. Music is FREE, but food and wine are not. Scottsdale Artwalk. (Phoenix Metro, FREE): Tour the Scottsdale Artwalk every week for exhibitions, demonstrations and entertainment on Thursday nights from 7 – 9 p.m.
Rawhide Western Town. (Phoenix Metro, FREE – $): Visit this old Western town Friday to Sunday, located off Wild Horse Pass and the 1-10 freeway just south of Phoenix. Parking is $5, and admission is free. They have a gift shop, and zip line available for an added cost. A steakhouse is available if you wish to eat there on location. Phoenix Fridays. (Phoenix, FREE): Downtown Phoenix’s hosts one of the nation’s largest, self guided artwalks every First Friday from 6 to 11pm, with free event shuttles available through out downtown and are headquartered at the Phoenix Art Museum. Cardinals Training Camp. The Arizona Cardinals have pre-season training starting in July for the weeks leading up to the regular season. Admission and parking are FREE for all open practices leading up to the season opener. Rio Salado Audubon Birds’N Beer. (Phoenix Metro, FREE – $): Every 3rd Thursday of the month, stop by the Audubon Center after work to learn a thing or two about birds and other wildlife while enjoying a cold Four Peaks brew and other snacks and beverages. The event runs from 5:30 – 7:30 p.m.
Tempe Beach Park. (Phoenix Metro, FREE – $$): Here you can have a picnic, take a leisurely bike ride (rent a bike at The Bicycle Cellar), rent a boat or paddle board, or have fun at the Splash Pad (open seasonally). Keep a look out for all the great festivals, concerts, and runs that take place at the Lake. Goldfield Ghost Town. (Phoenix Metro, FREE – $$): An old 1890’s mining town which has been revived and is now located on the historic Apache Trail. Admission to the town is free, tours and food are an added cost. Fort McDowell Adventures. (Phoenix Metro, $$$): If the weather is right, head over and enjoy a nice horseback ride in the beautiful Arizona desert. Check their calendar for availability. Phoenix Open Air Market. (Phoenix, FREE): The Phoenix Open Air Market is open Saturday mornings, year round, from 8 a.m. to 12 p.m. on Central and McKinley in downtown Phoenix. Singh Farms. (Phoenix Metro, FREE – $$): Farm fresh locally grown veggies and fruits right in the Tempe area, Saturday mornings and afternoons through 2 p.m.
Infusion Coffee and Tea. (Phoenix Metro, FREE): Join others in FREE public coffee and tea tasting events where you can taste them side by side. Farmers Market at Power Ranch. (Phoenix Metro, FREE – $$): Join the local areas of Gilbert and Mesa at the big barn at Power Ranch on Wednesdays from 4-8 p.m. for local entertainment, and food trucks galore. Buy local, handmade items and shop local organic produce (food and other items are a cost). Queen Creek Olive Mill. (Phoenix Metro, $$): Head to the far Southeast Valley to the Queen Creek Olive Mill — a family owned Agri-tourism experience. They are a sustainable Olive Farm and Mill and they produce Arizona’s only extra virgin olive oil. Tours are conducted regularly and they have a restaurant on site (which does cost). Hangar Cafe. (Phoenix Metro, $$): Head to the Hangar Cafe at Chandler Municipal Airport for lunch – you can watch the small planes take off and land as you enjoy some time right off the runway. Rustler’s Roost. (Phoenix Metro, $$$): This Western themed bar and banquet hall has Rattlesnake on the menu. It’s quite an adventure. The Yard. (Phoenix, $$$): A group of collective restaurants, The Yard is a unique dining experience that features lounge seating and outdoor games alongside 4 close restaurants. Rockin’ R Ranch. (Phoenix Metro, $$$): A real pioneer ranch with a history as intriguing as the West was Wild. A working cattle and horse ranch for generations, Rockin’ R Ranch does Wild West shows and gunfights, along with good old fashioned barbecue. Cosmo Dog Park. (Phoenix Metro, FREE): One of the best dog parks in the Phoenix area. This Gilbert dog park is a wonderful place for your furry friend to swim, play and let loose. Have you enjoyed any of these staycation ideas? Or do you have any additional to add to this list?